On June 12, 2018, the Fund for Railway Accidents Involving Designated Goods (FRAIDG) held its TTX with industry and government stakeholders in Ottawa, Ontario. The gathering provided the opportunity for FRAIDG to receive information and reflect on the claims, liability and compensation issues that could arise from a railway accident involving crude oil. It also enabled FRAIDG to reflect on its current capability to become actively involved in the many possible areas of indemnification following a railway accident and to better identify areas within FRAIDG in need of further preparation. The TTX provided a valuable opportunity as well for stakeholders to further familiarize themselves with one another in the absence of an event requiring the group’s collective attention. Topics covered at the TTX included the practical matters of how railways, insurers and others would interface with FRAIDG to demonstrate that the full minimum liability insurance coverage has been disbursed in the case where a railway accident exceeds the minimum liability insurance coverage to enable FRAIDG to pay claims. Matters related to the unique considerations of indigenous communities of Canada was also explored. Please consult the FRAIDG Administrator’s Take-aways document of the workshop for further information. Over the upcoming year, the FRAIDG will develop tools including guideline and procedure documents for industry feedback. If you would like to stay up to date on Fund related news, information, and discussions, please join our subscription list. The Table Top Exercise (TTX) was a follow-up of the Fund’s workshop held in Ottawa on November 30, 2017: some participants to this workshop submitted that it would be useful to push further the collective reflection about claims management issues related to various accident scenarios. identify the ones that need further preparatory work. She also saw a side benefit in this event in getting attendees - key stakeholders should an accident happen - get to know better each others’ approaches and sensitivities around claims management issues in “peace time”, thereby increasing chances that they interact efficiently after an accident. [Note: the Administrator’s action items being identified in green]. Attendance and participation into the TTX showed that a community of interest is developing around the crude-by-rail compensation issues. There seems to be a willingness from the key interests involved that the FRAIDG, as a new entity, can be of help in streamlining approaches to claims management and in helping to clarify and manage the grey areas of the indemnification process. 2.1 It is critical for the Administrator to know how much has been paid by the relevant railway company (or companies) after the accident, so that FRAIDG can become available as soon as the railway(s) has (have) paid up to its (their) limit of liability. 2.1.1. This information needs to be communicated from the railway(s) at stake. As soon as FRAIDG becomes triggered, the Administrator will also need to know which claimants have been already compensated by the railway(s), and for which damage, in order to avoid double compensation. Establishing communications protocols for railways in case of an accident involving designated goods is a key responsibility of the Administrator, as this is necessary for the triggering of FRAIDG’s compensation. This was already identified as an element of the Administrator’s action plan. 2.1.2. When more than one railway is at stake, the Administrator cannot start offering compensation until the aggregate limit of liability has been reached. The communications protocols that are necessary for the Administrator to know when the Fund’s liability is being triggered must therefore cover the situation where more than one railway is involved. This is an additional element to remember, which had not been previously captured. 2.1.3. Victims who are covered by individual insurance policies are likely to obtain indemnification directly from their insurer, who will become subrogated claimants to the railway(s) thereafter. Communication protocols with railways should provide for the information relating to claims from subrogated insurers. 2.2 The more damages qualify under s. 153(1) of the Canada Transportation Act, the more chances that the Fund will be triggered. Some damages caused during the accident may not have been caused by the crude oil shipment, but by another noxious substance carried by the same train, of by the impact ̷ derailment of railcars themselves, irrespective of their dangerous content. The issue is: are such damages covered by Division VI-2 of the Act, i.e. : are they covered by the statutory provisions on railways‘ strict liability and limit of liability? If so, the claimants for such damages have access to FRAIDG for excess liability. Arguably, it would be in the interest of claimants that all damages resulting from the accident be covered by the regime, whether caused directly by oil or by other cargoes or by the railway assets themselves. Clarifying in advance the meaning of “result” could help avoiding delays in the compensation of claimants, should the liability for such damages be channeled to the railway or paid by the Fund. The Administrator will sponsor a legal research on the meaning of ‘’result’’ under s. 153(1) of the Act and will circulate a discussion paper on her proposed approach to the eligibility of damages ‘’resulting’’ from the accident. 2.3 The higher the combined limit of railways’ strict liability under the Canada Transportation Act provisions (if more than one railway is involved), the lesser chances that FRAIDG will become involved in the settlement of claims. Should a claimant believe that a railway is ‘’involved’’ in the accident and therefore responsible for the damages (while this railway denies its “involvement” in this accident), the triggering of indemnification by FRAIDG might arguably be suspended for years pending resolution of the ‘’involvement’’ issue by courts. This would not be in the interest of claimants, who would otherwise obtain indemnification from the FRAIDG as soon as the limit of liability of the other railway(s) has been reached. Clarifying in advance the meaning of “involved” would hopefully help avoid delays in indemnification of claimants, whether this indemnification is provided by the railway or by the Fund. The Administrator will sponsor a legal research on the meaning of ‘’involved’’ under s. 152.7 of the Act and will circulate a discussion paper on her proposed approach to the ‘’involvement’’ of railways for the purpose of determining the railways’ combined limit of liability triggering indemnification by FRAIDG. 2.4 If a railway is not able to pay up to its limit of liability and files for bankruptcy, one may wonder whether FRAIDG’s liability becomes triggered at this point and whether the Administrator can start compensating claimants (becoming thereafter a subrogated claimant filing a claim in bankruptcy). Alternatively, claimants would receive partial payment of their claim out of the bankruptcy fund and would file a claim with FRAIDG for the balance. Railways’ limits of liability and mandatory insurance requirements reduce the likelihood that a railway carrying crude oil files for bankruptcy after a derailment. However, a railway accident may generate other types of liabilities than the ones covered by the mandatory assurance and by the limit of liability, thereby putting pressure on the railway’s liquidities available for compensation. It is still unclear how the bankruptcy regime would interplay with the management of claims under the FRAIDG regime, should the railway file for bankruptcy because of these other liabilities. Clarifying in advance the possible interplay between the bankruptcy and the FRAIDG regimes could help optimizing the outcomes for claimants. The Administrator will sponsor a legal research on the potential interplay between the bankruptcy regime and the FRAIDG and will circulate a discussion paper on her proposed approach to this interplay, should it occur. Payers other than railway Insurers will likely be leading in delivering information on the availability of compensation and in helping claimants with claims. Payers should prioritize the settlement of damages for death. Depending on circumstances, some (other) claims could be prioritized as well. Convenience class may be used for living expenses with fixed rates for certain types of losses. Victims covered by personal insurance should trigger their personal insurance policies first: car insurance, home insurance, etc.. The insurance companies would then go against the railway companies as subrogated claimants. Private insurers may have caps on what is recoverable. Additional loss may be recoverable as a second step from the same or other payer. This will have to be mapped out at the outset. Red Cross could recover/claim for its services, but not for the donations it received from the public and gave out to the victims. Information on who has received a donation from Red Cross is not shared and cannot be accounted for. The Administrator takes stock of this common ground, but notes that further discussion is needed to determine the level at which coordination should occur and to clarify what a joint claims office would entail. This will be part of the upcoming discussions with key payers in developing the Key Payers’ Network Readiness Plan. The Administrator also notes that the new liability regime should be conducive of a swift settlement of the claims by the various payers involved, which should render class actions against railways irrelevant. However, the filing of class actions would likely jeopardize many of the benefits potentially attached to the new liability regime, including full and prompt compensation for claimants. Clarifying in advance the possible interplay between class actions and the FRAIDG regime could help optimizing the outcomes for claimants. The Administrator will sponsor a legal research on the potential interplay between class actions and the FRAIDG and will circulate a discussion paper on her proposed approach to this interplay, should it occur. 3.2 The Administrator also noted a number of discussions relating to the need for response organizations to have pre-arrangements with their ‘’payer’’ (railway companies or provinces), in order to ensure that the cash flow needed to finance response operations will be available in due time. Pre-arrangements for the financing of response operations falls outside of the Administrator’s mandate; however, the Administrator can relay this concern to the regulator. 3.3 Indigenous claims: there has been cases of settlements for cultural losses / loss of spiritual value in the past, however these are losses difficult to quantify. The Administrator had already planned to sponsor additional research and to circulate a discussion paper on the assessment of indigenous loss of fishing, hunting and gathering opportunities (a type of damage specifically mentioned in the Act); as a second step she might eventually consider an additional research on the assessment of cultural loss/loss of spiritual value (a type of damage not specifically mentioned in the Act) if needed. The Administrator notes that the claims management process can be improved by reducing a number of risks attached to statutory interpretation as well as to the interface with other potential judicial avenues (bankruptcy, class actions, claims under the Fisheries Act). Most importantly, the protocol to determine involvement of FRAIDG in any given incident needs to be refined and will require further consultation. Assessment of indigenous loss of fishing, hunting and gathering opportunities. Another workshop may be warranted, towards the end of 2019/beginning of 2020 to take stock of the readiness of the FRAIDG regime and adjust as necessary. The Fund for Railway Accidents Involving Designated Goods, referred to as FRAIDG or the Fund throughout this document. Should more than one railway be involved in the accident. For example: a Class 1 railway that subcontracted part of the original contract of carriage to the railway which was carrying the shipment at the time of the accident. Because the accident did not happen on its tracks or with its train. For example, claims from a railway not within the legislative authority of Canada, claims from rail shippers impacted by the accident, or claims for loss of income from commercial fishing are not covered by the new strict liability regime/FRAIDG (see para. 153(2) (a), (b) and (c)): such damages could still be claimed for under other regimes. The Administrator further notes that even when the involved railways’ combined limits of liability are not reached (and that FRAIDG is not triggered), the railways involved should collaborate as their liability is joint and several. A joint/single claims ‘’office’’ for both railways should be an efficient way to receive and settle claims for the two companies involved – so that the claimants (included subrogated claimants) do not have to pick a company, or to file their claims twice. 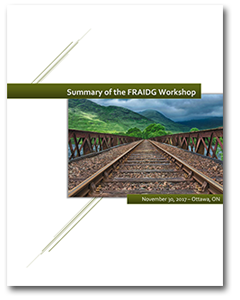 The Fund for Railway Accidents Involving Designated Goods (FRAIDG) held a workshop in Ottawa on November 30, 2017. The purpose of this workshop was to plan and strategize with key stakeholders in order to improve the FRAIDG’s indemnification readiness and efficiency on specified issues related to claims, liability, and compensation regarding railway accidents involving designated goods. The workshop touched upon the triggering of the FRAIDG claims process, the draft Claims Manual, claims valuation and claims assessment process, and next steps. It became evident that in order for the Fund to fulfill its mandate, i.e. to be prepared to process claims and indemnify claimants in an efficient way should an accident happen, it should begin engaging with key stakeholders immediately. In the coming months, the FRAIDG will circulate the amended draft claims manual and its draft policies. It will also consolidate its key stakeholder network by engaging and meeting with various key stakeholders. Over the upcoming year, the FRAIDG will develop discussion papers that look at potential grey areas. Some of these discussion papers may be issued jointly with other agencies that share the same issue(s). This document summarizes the workshop, including some of the feedback provided during and after the workshop.